For other ships with the same name, see HMS Ark Royal. HMS Ark Royal (R09) was an Audacious-class aircraft carrier of the Royal Navy and, when she was decommissioned in 1979, was the Royal Navy's last remaining conventional catapult and arrested-landing aircraft carrier. She was the first aircraft carrier to be equipped with angled flight deck at its commissioning; her sister ship, HMS Eagle, was the Royal Navy's first angle-decked aircraft carrier after modification in 1954. 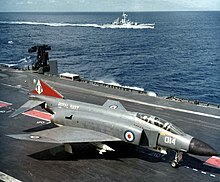 Ark Royal was the only non-United States vessel to operate the McDonnell Douglas Phantom at sea. Ark Royal was the sister ship to HMS Eagle, which was initially named HMS Audacious, hence the name of the class. Four Audacious-class ships were laid down, but two (HMS Africa and the original HMS Eagle) were cancelled when World War II ended, and construction of the other two was suspended for several years. Both surviving ships were extensively upgraded throughout their lifetimes. The contract was placed with Cammell Laird of Birkenhead / Sheffield in 18 March 1942 to build vessel number 1119. The ship was originally designated Irresistible, but was renamed Ark Royal prior to launch. The immediately previous Ark Royal, also an aircraft carrier, was torpedoed off Gibraltar on 14 November 1941 with the loss of one member of the ship's company. She was launched in 1950, and her completion took five more years. In this time, she underwent redesign and, when completed, she was markedly different from her sister ship. Shortly before her launch from the Cammell Laird shipyard, an image of the ship painted with her white undercoat was captured by the pictorialist photographer E. Chambré Hardman. This has been exhibited many times under the name 'Where Great Ships Are Built' and later 'Birth of the Ark Royal'. When commissioned, she had a 5.5° partially angled flight deck, two steam catapults capable of launching aircraft weighing up to 30,000 pounds (14,000 kg), a deck-edge lift on the port side (the first British ship to be fitted with such a device), modified armament, and the new mirror landing system. Ark Royal was the first ship to be constructed with an angled flight deck and steam catapults, as opposed to having them added after launching. These innovations allowed aircraft to land and take off from the carrier at the same time. 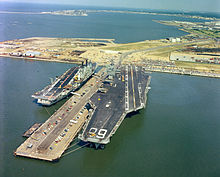 Her flight deck as built was 800 by 112 feet (244 by 34 m). A further four years passed before she commenced her sea trials. About a year after commissioning, her forward port 4.5-inch (110 mm) guns were removed to improve aircraft operations over the angled deck. Four years later, the port deck-edge lift and the forward starboard 4.5-inch guns were also removed. After the 1964 refit only one twin 4.5-inch gun mount remained aft on port and starboard side. From 1967 to February 1970, she underwent a refit which was a major rebuild to her structure, but only an austere update to her electronic equipment, and was confined to changes needed to operate the RN's version of the Phantom. Prior to, and during the refit, concerns over costs, the age of the hull and changing political opinions over naval requirements threatened the refit and even a possibility that the ship could be scrapped however convincing arguments to retain and upgrade the carrier won through. The refit cost around £30 million; far less than the modernisation of Eagle but also added several improvements, which allowed her to comfortably operate the larger Phantom and Buccaneer Mk.2 aircraft. Like Eagle her modifications included a full 8.5° angled flight deck, new and far more powerful steam catapults, bridle-catchers, heavy-grade jet-blast deflectors (both of which Eagle did not receive), and heavy-weight arrestor cables.Twelve hundred miles of new cabling was installed, but the ship was not completely rewired and retained old DC electrics. A modified island (with a different arrangement from Eagle) and a partially new electronic suite were also added, though some of her original radars, such as 983 heightfinders were retained and she did not receive the 3-D air-search radar set that her sister had fitted, instead two double-array 966 versions of the standard RN 965 long-range system were fitted and one of the new 986 sets. Significantly, Ark Royal was the first and only RN carrier fitted with USN carrier approach, AN-SPN 35 radar, increasing night aircraft operational capability and safety. Her flight deck size was increased port aft, however, giving her extra deck-park space for her airgroup that Eagle did not have. She was also fitted for four Sea Cat missile launchers, for defensive armament which were operational in 1973. Significantly, there was little more than an overhaul of her steam turbines and boilers, meaning that mechanically she was very dated; however, the stripping out of Eagle meant that for a time essential spares were available. Ark Royal was then scheduled for at the most only five years' more service by a new government policy to scrap the carriers by 1975. Intensive maintenance as well as a new programme of continuous servicing and repair (with RN maintenance ships always in her task groups), was able kept her going until late 1978, though increasing mechanical and electrical failures led to her decommissioning in early 1979. Initially on entry into service, the ship had a complement of up to 50 aircraft comprising Sea Hawks, Sea Venoms, Gannets, Skyraiders and various helicopters. As later aircraft types grew in size and complexity, her air group fell to below 40 when she left service in 1978. Ark Royal (background) operating with USS Independence (foreground) in the North Atlantic, 1971. Ark Royal participated in many exercises as part of the British fleet and NATO (North Atlantic Treaty Organization) squadrons, but saw no combat duty. She was not involved in the Suez Crisis in Egypt of 1956, about a year after her commissioning, because she was on her way there when she ran a main propellor shaft bearing and had to return to Devonport for a major refit. Eagle replaced her at Suez. In 1963, she carried out trials for a new type of Vertical/Short Take Off and Landing (V/STOL) aircraft, the Hawker P.1127, which later developed into the Hawker Siddeley Harrier. The same aircraft, now having been redesigned and developed as the British Aerospace Sea Harrier, was later accepted as the primary strike capability of the future third and last Ark Royal from 1980 onwards. She was part of the Beira Patrol enforcing the naval blockade of Rhodesia in 1965. 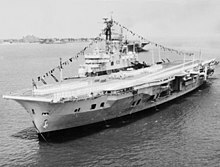 The 1966 Defence White Paper planned the end of British aircraft carriers in the early 1970s but she went into dock for her refit to head off dockyard redundancies and the likely political issues. A new government re-examined the case for carriers finding that shore-based aircraft could not provide adequate cover for British concerns "East of Suez". On 9 November 1970 while in the Mediterranean to participate in a NATO exercise she collided with Bravyy, a Soviet Navy Kotlin-class destroyer which was shadowing Ark Royal (a common practice during the Cold War). Ark Royal was slightly damaged, while the Soviet destroyer sustained minor damage and two missing crew. Ark Royal's commanding officer, Captain Ray Lygo, was cleared of blame at the subsequent court-martial. The ship featured in the 1960s British television series Not Only... But Also starring Peter Cook and Dudley Moore. In one episode, they used the ship's catapult to shoot a piano into the sea. When commissions ended, items were fired off the catapult, including pianos and once a toilet complete with paying-off pennant. By 1970, Ark Royal had a complement of 39 aircraft. This typically comprised 12 Phantom FG MK.1s, of 892 Naval Air Squadron, 14 Buccaneer S MK.2s of 809 Squadron, 4 Gannet AEW Mk.3s of B Flight 849 Squadron, 6 Sea King HAS Mk.1s of 824 Squadron, 2 Wessex HAR Mk.1s of the Ship's Flight and one Gannet COD Mk.4. later replaced by an AEW3. The Buccaneers doubled as tanker aircraft, using buddy refuelling pods, and as long-range reconnaissance aircraft with bomb bay-mounted camera packs. In July 1976, she represented Britain at the United States Bicentennial Celebration in Fort Lauderdale, Florida. 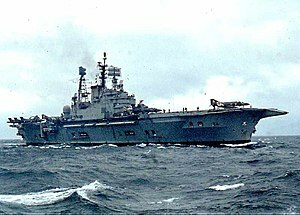 In 1972, the Buccaneers aboard Ark Royal took part in a long-range strike mission over British Honduras in Central America shortly before its independence as a constitutional monarchy named Her Majesty's Government of Belize to deter a possible Guatemalan invasion, who had long-standing territorial claims. In 1977, under the flag of Admiral Sir Henry Leach KCB Commander-in-Chief Fleet, Ark Royal led the Royal Navy's tribute to and celebrations of Queen Elizabeth II's Silver Jubilee at Spithead. In the mid-1970s, the ship made a return to television. A major BBC documentary series, Sailor was made, showing life on board the ship during a February to July 1976 Western Atlantic deployment. Her commanding officer at this time was Captain Wilfred Graham, a later Flag Officer Portsmouth and the ship's Commander (executive officer) was Commander David Cowling. The theme tune for the programme was "Sailing" by Rod Stewart – a song that came to be associated with the ship and her successor. She visited Fort Lauderdale, Florida from 30 May until 14 June 1978. She entered HMNB Devonport on 4 December 1978 and decommissioned on 14 February 1979. Like her sister Eagle, she had a relatively short (24-year) life, and when the White Ensign lowered for the last time the Royal Navy no longer had fixed-wing aircraft at sea, a situation that persisted until the commissioning of the Invincible-class light aircraft carriers, with their complements of Sea Harrier VTOL aircraft, in the early 1980s. On 29 March 1980, the Ministry of Defence (MOD) announced that she would be sold for scrap and so ended plans to preserve her. She left Devonport on 22 September 1980 under tow to be scrapped at Cairnryan near Stranraer in Scotland, arriving on 28 September. When arriving at the breakers, her sister ship Eagle was in the final process of being broken up there. Breaking up of Ark Royal took until 1983. During this period, many ex crew travelled to the breakers jetty at the remote corner of Loch Ryan to pay their last respects, some reduced to tears when seeing the ship being torn to pieces. However, various parts of the ship remain as souvenirs or memorials; for instance, an anchor (along with an anchor from her sister ship Eagle) outside the Fleet Air Arm Museum at RNAS Yeovilton. One of her other anchors is in Armada Way, Plymouth near Plymouth Hoe. While Ark Royal's career spanned 24 years from the time of her commissioning (her name was a household word), she spent as much time in refit; repair and reserve and modernisation as in commissioned service (12 years). It required a lot of effort from her engineers to keep her serviceable between yard periods. Ark Royal had been poorly preserved during its lengthy construction from 1942 to 1955, and much of its machinery was obsolete by its completion, including its dated DC electrics, supplemented later by some AC systems, resulting in a ship which experienced regular defects and mechanical failure. Eagle was a more reliable and well-built ship, and spent far more time at sea than her sister. The scrapping of Ark Royal in 1980, two years after Eagle, marked the end of conventional fixed-wing aircraft operations aboard Royal Navy carriers. She had borne so many innovations, yet her replacement was not equipped with any of these. There was some discussion about preserving her as a museum ship, and some private funds were raised; the MOD would not sanction these efforts. The Fleet Air Arm Museum has subsequently mimicked the ship's island and flight deck in its central hall as an Aircraft Carrier Experience exhibition. The Centaur-class aircraft carrier HMS Hermes remained in service after her, but had been converted to a helicopter commando carrier in 1971 and then as a V/STOL carrier. The much smaller Invincible-class aircraft carrier could only carry vertical/short takeoff and landing aircraft and helicopters. The two new Queen Elizabeth-class carriers, due to enter service in 2017 and 2020, were originally designed to operate V/STOL aircraft. Despite expert advice, and in an attempt to reduce costs, the UK government requested that the new carriers be modified to operate conventional CATOBAR (catapult-assisted takeoff and barrier/arrested recovery) aircraft. Fitting electromagnetic catapults would have required huge structural changes and an upgrade of the ships' energy generation, which proved infeasible and resulted in a decision to return to the original configuration. ^ Smith, Lionel A. "Images from Ark Royal's Sixth Commission – Page 7 Russians". Lionel's Home Page. Retrieved 15 February 2015. ^ White, Rowland (2010). Phoenix Squadron: HMS Ark Royal, Britain's last Topguns and the untold story of their most dramatic mission. Corgi. ISBN 978-0552152907. ^ "Programme of the Silver Jubilee Fleet Review" (PDF). Retrieved 15 February 2015. ^ D. Hobbs. British Aircraft Carriers. Seaforth (2013),p295. ^ "Jump jets return as Government scraps 'cats and traps' plan for future carriers". Navy News. Royal Navy. 10 May 2012. Retrieved 15 February 2015. Beaver, Paul (1979). Ark Royal, A pictorial history of the Royal Navy's last conventional aircraft carrier. Cambridge: Patrick Stephens. Blackman, Raymond (1973). Ships of the Royal Navy. London: Macdonald and Jane's. Chesneau, Robert (1984). Aircraft Carriers of the World, 1914 to the Present; An Illustrated Encyclopedia. Annapolis: Naval Institute Press. Gardiner, Robert (1983). Conway's All the World's Fighting Ships 1947–1982. London: Conway Maritime Press. Hobbs, Commander David (October 2007). "HMAS Melbourne (II) – 25 Years On". The Navy. 69 (4): 5–9. ISSN 1322-6231. Wikimedia Commons has media related to HMS Ark Royal (R09).